2019 is going to be a very big year for Apex and we are pushing to make your experience with us even better. As many of you know and some of you may not know we have a knowledgebase where we have tons of guides, tutorials and information to help you gain a better understanding on what you can do with your Apex server and how to setup things whether it’s a plugin, modpack, custom map, etc. We are proud to introduce the start of our knowledgebase update initiative to make it a much easier and intuitive experience for all of you. With the first big update we have introduced a new search functionality so you can type in exactly what you are looking for. We also got rid of all those pesky photos with a much cleaner looking system that categorizes all the guides making it easier to navigate through. 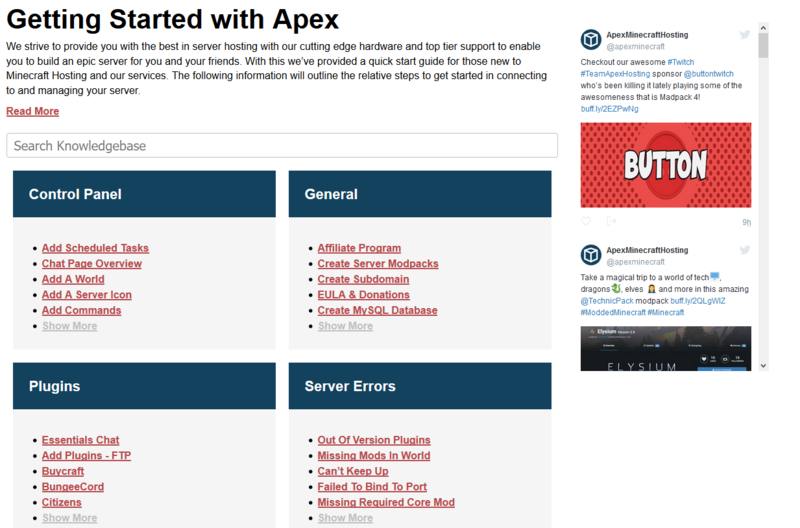 This is only the first step in making a much easier experience for you all to learn how to manage your Apex server with us. We have much more planned to rollout later this year such as updating all the guides themselves with better information, new videos, new guides and more. Feel free to checkout the new knowledgebase here. Hope you enjoy the new look and until next time!